Drugs, natural or synthetic, are used in the diagnosis, alleviation, treatment, prevention or cure of disease. 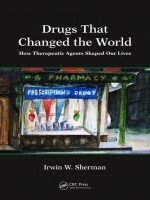 This is a book about some of these therapeutic agents, how they came to be, and how they exert their ‘magic’. Today we have drugs to protect against infectious diseases, to alleviate aches and pains, to allow new organs to replace the old, and for brain functions to be modified. Yet, for the most part the manner by which drugs are developed and by whom remains a mystery. More than just a pill or liquid some drugs have shaped our lives and Western civilization. The author has selected an array of drugs that represent milestones—those affecting our well-being and influencing social change. The stories are told in a dramatic fashion and include spectacular successes and dismal failures. And, the history of drug discovery is filled with colorful personalities – the selfless and the conniving – the bold and the shy, the collaborator and the retiring loner. This book is for the curious. It is for those who want to know more about the science behind the label on the prescription bottle or the vial of vaccine.